Batman and Wonder Woman are fighting some kind of soldier. According to Batman, they are looking for Weapons of Mass Destruction (WMD for short). 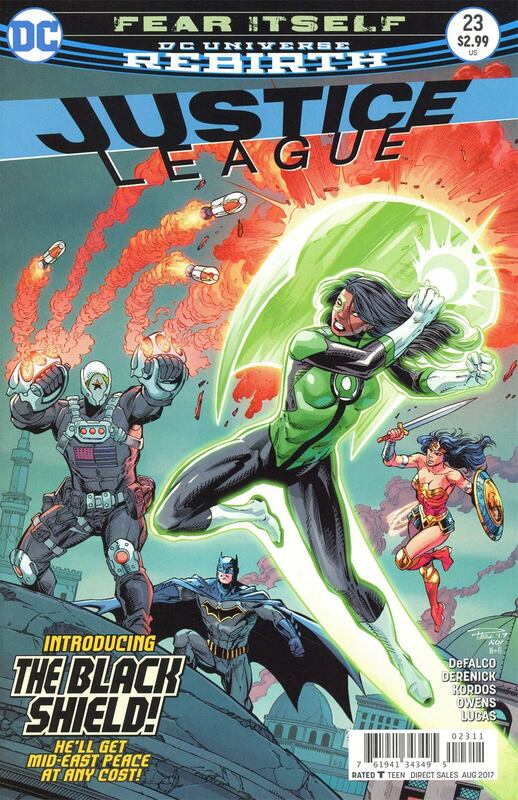 Wonder Woman asks Green Lantern where she is, and Jessica Cruz tells them she believes she has found the leader. He calls himself The Black Shield (1st Appearance) and claims he is the good guy and plans on stopping terrorists by wiping out everyone who lives in populations that is known to harvest terrorists. After a very brief battle, in which we see Black Shield use Jessica's powers against her, Jessica crashes into a home freighting a little girl and her mother. Black Shield manages to get his WMD launched but not before Jessica rejoins the fight and contains the explosion inside a green sphere. Up on the Watchtower Cyborg informs the trio that it is a compound designed to melt human flesh. Batman asks Jessica if everything is okay and she shrugs him off. Wonder Woman then confronts Jessica and asks her the same question, teasing she will use her lasso of truth if need be. Jessica confides in her and says she was embarrassed that she let Black Shield best her in battle and felt guilty scaring that family whose house she crashed into. Wonder Woman tells her collateral damage is always a possibility but we do what we can to minimize it. Batman overhears this conversation and tells her the alternative was for the WMD to go off and that whole town dies. Jessica says that child will see her face and be fearful of it when she closes her eyes every night. She then says, "Can you even imagine what it is to experience such terror? To feel so weak and helpless?" Batman replies, �Yes... I... Can� and walks off. Jessica asks Wonder Woman, �Did I just step into something?" Wonder Woman is shown scaring information from the soldiers they captured during the first encounter asking where the next target is. Batman and Wonder Woman are having a hard time taking out Black Shield, his force shield is just too tough. Jessica Cruz comes out of nowhere and entraps Black Shield in some type of enclosed construct, but not before he launches eight new WMD's toward the city. Wonder Woman convinces Jessica that she has the will power to stop them all and she does just that. Jessica flies off saying she will always keep trying. Next issue: Justice League vs Mera?! Story - 3: It was a well told story, I often enjoy these one and done stories as too many are 6 or 7 issues to tell a story to make it the perfect size for a trade paperback. So when these one and done stories come along they are a breath of fresh air. The main problem I had with the story is how many "I am not good enough to have a ring" story lines do we have to read? It is almost as if the writers have no clue what to do with her as a character if they don't do that type of story. She has had a ring for a while now, when will this self-doubt end and we see her true potential? Art - 3: While overall not bad, good layouts, nice bright colors, I have a problem with the way he drew the faces for almost all the characters. For me this takes away the overall quality of the art. Maybe I am too picky. Cover Art - 4: While not the best looking cover I have ever seen, it tells you exactly what you're getting when you buy this book. Too many comics these days show you one thing and tell a completely different story. 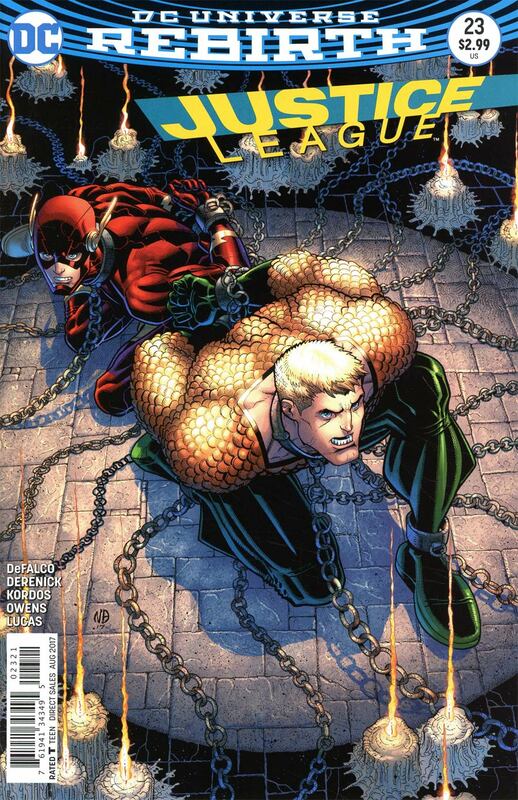 Variant Cover Art - 2: The complete opposite of the main cover, neither Flash or Aquaman even appear in the title. That coupled with a blocky style, which I personally am not a fan of, cuts the first cover's score in half.